Spacious studio of 26m2 located on rue du Vertbois in Le Marais - 3rd arrond - close Place de la R�publique and Arts & M�tiers. In a beautiful 18th century building, the apartment is situated on the 3rd French floor via stairs. Nicely furnished living room with wooden floor, two large windows facing the street, flat screen cable TV, internet access and a sofabed for 2 people. Several closets. Tiled bathroom with shower & washer and separate WC. A well equipped kitchen area. A beautiful studio with a lot of light. Located right in the heart of Paris, close to Centre Georges Pompidou in the historical Marais Area. One of the oldest buildings in Paris, the house of Nicolas Flamel,is just a few steps away as well as the well know bistro \"L\'Amis Louis\". Art galeries, all kinds of shopping, caf�s, bistrots and also supermarket, bakery, chemist and dry cleaning. 5 minuits walk to rue de Bretagne with open food market and lots of food & wine stores. 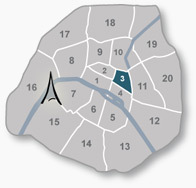 10-15 min walk to Mus�e Picasso, Place des Vosges, Notre Dame de Paris, Ile de la Cite and Ile St-Louis. Livingroom with 2 large windows facing the street, sofabed for 2 people, flat screen TV, internet access and a high table with 2 stools. Wooden floors with carpet. Kitchen area with refridgerator, vitro ceramic cook-top, micro wave & kitchen utensils. Tiled bathroom with large shower, sink, towelrack & washer. Views from the main entrance & rue du Vertbois in Le Marais.